Don’t get me wrong. Most people would look at my life and the people I hang out with and never suggest that I am. In fact, for the most part, I wouldn’t say that I am. But, there are these small little pieces in the secret places of who we are; and it is in there, that I think I am racist. And, I am hopeful I will have the courage to press publish when I am done writing this. Two of them took came recently at a conference in NYC called Movement Day 2013. I hadn’t been to Movement Day before and didn’t really know what to expect. All I knew what that it seems that here in Kalamazoo God is doing something great and is generating a Gospel Movement to transform our little city, and that Movement Day is a conference about exactly that. I went to the conference hoping to get some ideas to bring back, and understanding of how to steward such a movement, some practical tools and inspiration. I got all that (it really is an amazing conference), and a whole lot more. Already God was working on me in regard to what is happening in Kalamazoo and what needs to happen. And then during the pre-conference it seems God really set me up. Sitting with my friend Keith, we were to look at the current reality of Kalamazoo and identify what is missing. It was clear to me what was missing – involvement from some of the African American churches. In my head I am asking the question, “how do we get them to get involved in what we are doing, and why aren’t I doing anything about it? Moments later one of the African American leaders from another city talked about racial division and what racial collaboration can look like. He shared how it first starts in relationships and finding the courage to meet one another on each others’ turf. That troubled me. I already knew it was about relationship. And, I thought I had really good relationships with some African American pastors/leaders. But… I also knew, deep inside, that I hadn’t done anything to build a relationship with the pastors on the “north side.” Why haven’t I bothered? One day later, in the middle of the conference, I am confronted by a very raw dialogue by Connally Gilliam (white and resourced) and Sherry Jones (african american & not as resourced) about their relationship and cross racial collaboration. In that conversation Connally confessed to some areas of racism that I just hadn’t even thought about. She said she realized that she believed “That Christianity was somehow a white religion and others got to just come along…” Some ways of just being in the world are inherited in a white, middle class, resourced life. And I began to ponder with God…. What do I really believe? I didn’t set out to be racist. My parents certainly didn’t set out to raise me to be racist. But I grew up in an all white little town in the middle of a mostly white state. Wait…! Remember the commitment I made to Keith – to build relationships? The Monday morning after the conference I get an email from some guy I have never met. It was an invitation to the prayer breakfast hosted by the Northside Ministerial Alliance. Really God? I had never been to one of their meetings and I had never before been invited. Clearly this was God’s way of opening a door for me to begin living into a commitment I wasn’t sure I wanted to keep. But God wasn’t done. The featured speaker at the prayer breakfast was none other than Rev. 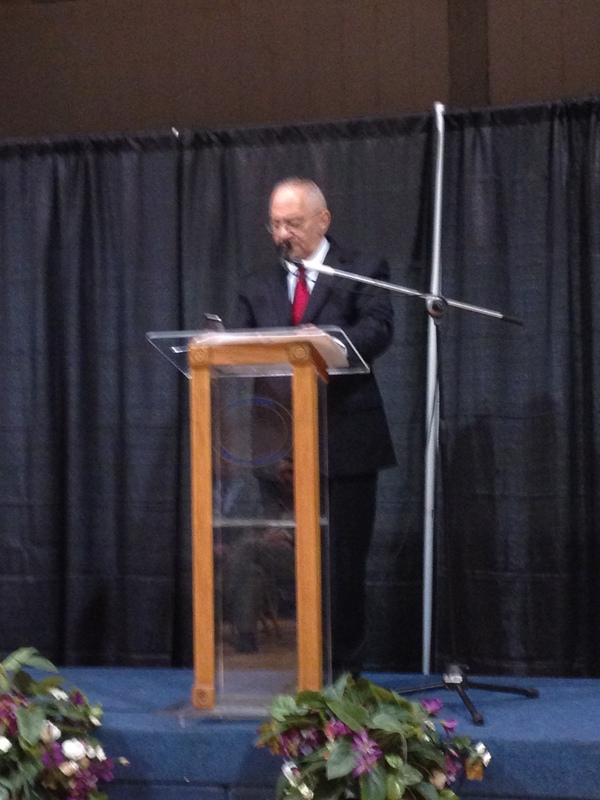 Dr. Jeremiah Wright. The Dr. Wright who made headlines because of harsh statements made about the United States and white people in general as a spiritual advisor to President Obama. You know, the guy who made national news out of Chicago! I show up for the breakfast knowing I will get to sit with some other peeps I know from the community. People from another nice suburban church. What I didn’t know! I didn’t know I should have dressed for The Oscars not my jeans and untucked button down. I didn’t know I would be sitting right in the middle of the very front for everyone to look at – even as a high extrovert I was a little uncomfortable. I didn’t know God wasn’t done bringing stuff up out of me. Dr. Wright gave a great message based out of Lamentations 4:17 and looking for help where there is no help to be found. He was funny, sharp, brilliant and seemed to hit me hard. In the middle of his talk he ran through a litany of where the Africans and then African Americans had looked for help in places it cannot be found. In the middle of that litany I found myself feeling a wide array of emotions from anger, sadness, hopelessness, bitterness, etc. I also found myself wanting, but unable, to distance myself from what he was saying. I didn’t want to hear in his voice the pain of the African people. I didn’t want to hear from him the stark reality of the current situation. My life is pretty squeaky clean and I like it that way. Why don’t I want to know the story and pain of the African American? I love my life. I have an amazing wife and family. I get to do the kinds of things I know God has wired me and given me deep passion for. I don’t like being racist. And it isn’t that I have a dislike or hatred for anybody. What I am discovering is that there is a part of me that loves the version of the American Dream I get to live. I have been discipled by a white middle class version of the American Dream more than I have been discipled by Jesus and fear of stepping out of that keeps me stuck. The good news is this. God is reconciling all things and people to himself and the Spirit is alive! And, I have a good friend, James, who has promised to help me. He wouldn’t have, however, if I hadn’t found the courage to authentic with him.